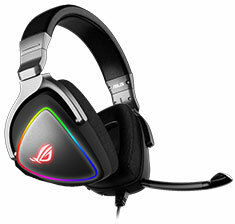 The ASUS ROG Delta is the world's first gaming headset with the industry-leading, hi-fi-grade ESS 9218 quad DAC, which delivers impeccably clear and detailed sound to give serious gamers the edge they need to win. ROG Delta features a USB-C connector and comes with a USB-C to USB 2.0 adapter to let you game on your PC, console and mobile device without changing headsets. A one-of-a-kind, circular rainbow RGB lighting effect provides a stylish look to set you apart on the battlefield.